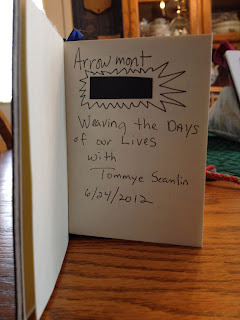 This years diary is growing close to the end and there are so many things to think about. Here is a shot taken earlier today with the month of November and a start for December. 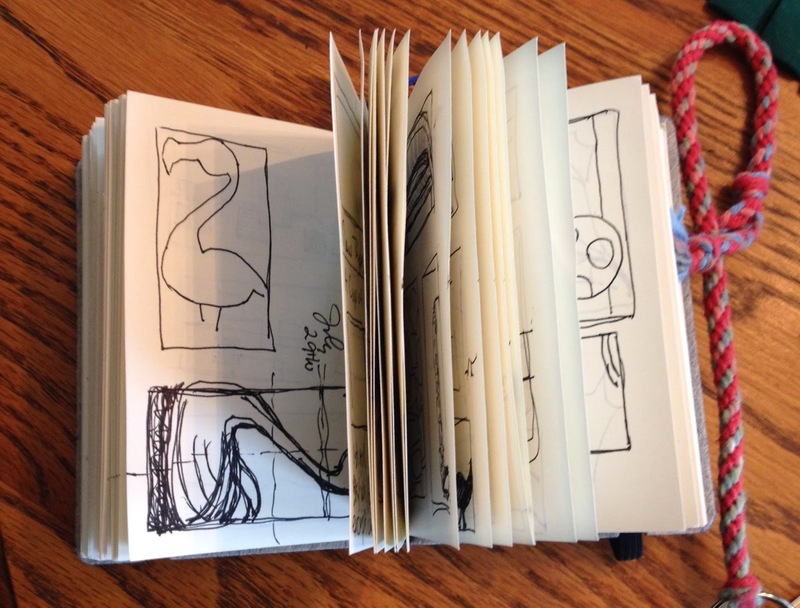 This years diary is in three separate pieces but I am thinking of attaching them to make one piece for display in the finishing. It will be exciting to take them off the loom and consider the options. 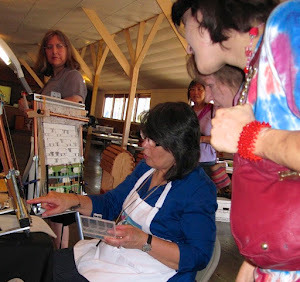 Much of the activity in the diary this month centers around the ongoing studio project, some traveling and the holiday. Much of this would be difficult to decipher without assistance like the suitcase with clothes inside, my car with the trunk open ready to be loaded and some landscape memories of the drive to and from Texas. There is also an upright dolly for the day we set up the show. When I returned I painted an old desk that had been in the attic for the new studio so I did a square that shows the desk outside where I painted it. I have a new wooded path that Laddie and I walked at a nearby park down by the river that was studded with rock. It was such a lovely walk with fall leaves covering the ground that I wanted to weave it. Next a brand new Lamy Safari Pen for drawing in the pocket of my denim shirt and further along a Feather Duster to show that some cleaning for the holiday did take place. Thanksgiving is marked with a big gold T and the day before shows Pumpkin Pie in the Sky. I wove it before I baked it this year. I also did some experimenting on several days with pick and pick and half passes in random designs, often with bits of leftover weft which were fun and effective in the design. 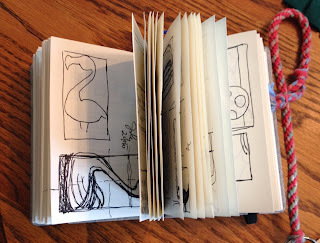 As I weave the end of this year I am planning the design for 2014. I will share more about that soon. I have also been working steadily on the Mango Hunters. I was hoping to be further along at this point but have to admit that the studio project has delayed things a bit. Still I think that I can be very close to finished by the end of the year. I will need to move the warp forward one last time so here is a current picture. As I was photographing it today I began to think of what I have learned about making cartoons for tapestry and what I might do differently on the next one. I will definitely make a very visible grid on the next cartoon to make lining things up easier. 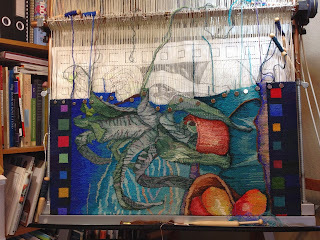 Considering how many changes I have made to the original drawing I think that next time I will make a second copy of the final version that way I will have one to put behind the warp and another to use for thinking about areas I might redraw or change as I am weaving. 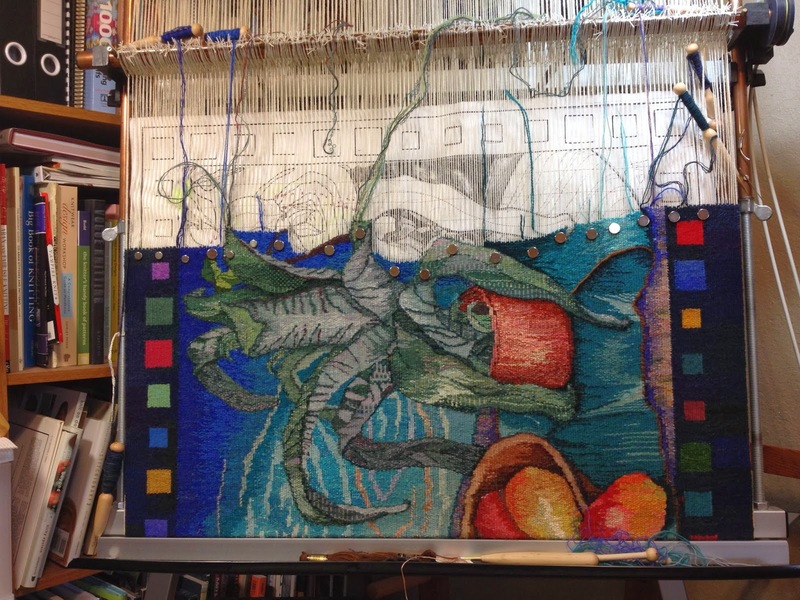 Perhaps there will be less changes on the next one because I have developed a better sense of designing the cartoon to suit the weaving, but it is best to be prepared. I have to say that despite what I have read about the possible problems with using magnets to hold the cartoon in place, I love them. 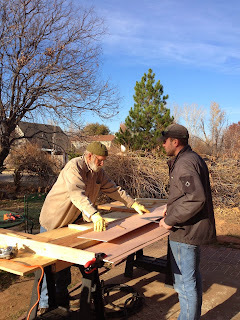 I have not had any problems with them other than learning how to work with them and I am so happy to be able to easily move them around to position them just as I want them as I am working. Even if they are just used as an addition to stitching the cartoon in place it would still be convenient and time saving from my point of view. One of the helpful things I did do this year is to make a small copy of the design which I placed on the wall next to the loom. It was very helpful to have this smaller copy to look up at occasionally. 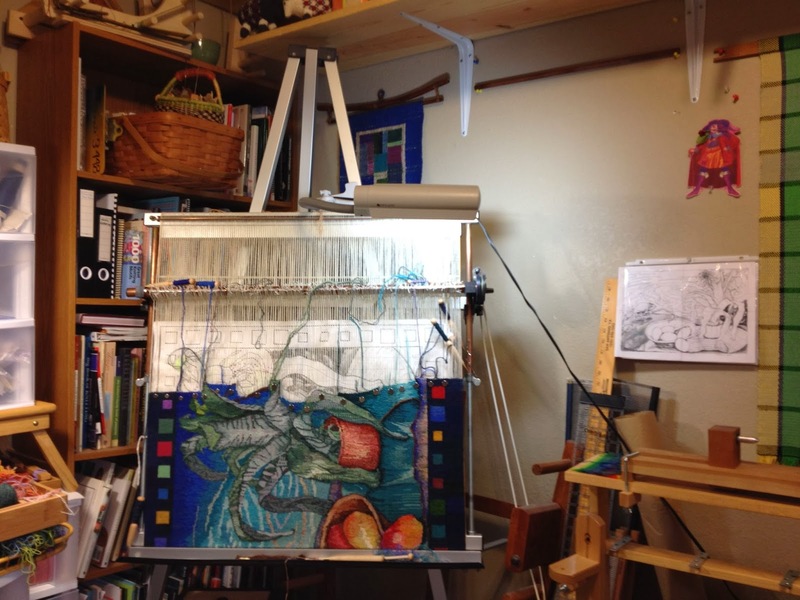 There were times I felt too close to the part of the tapestry I was weaving and needed to gain perspective of the whole design. Having the smaller version to refer to has been very helpful in making decisions with the whole design in mind. 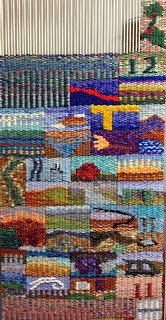 The Sheep Breed Sampler tapestry is also very close to completed but I don't have a space for working on it until the studio is ready so I will be showing it soon. I contemplate lots of finishing work for 2014. 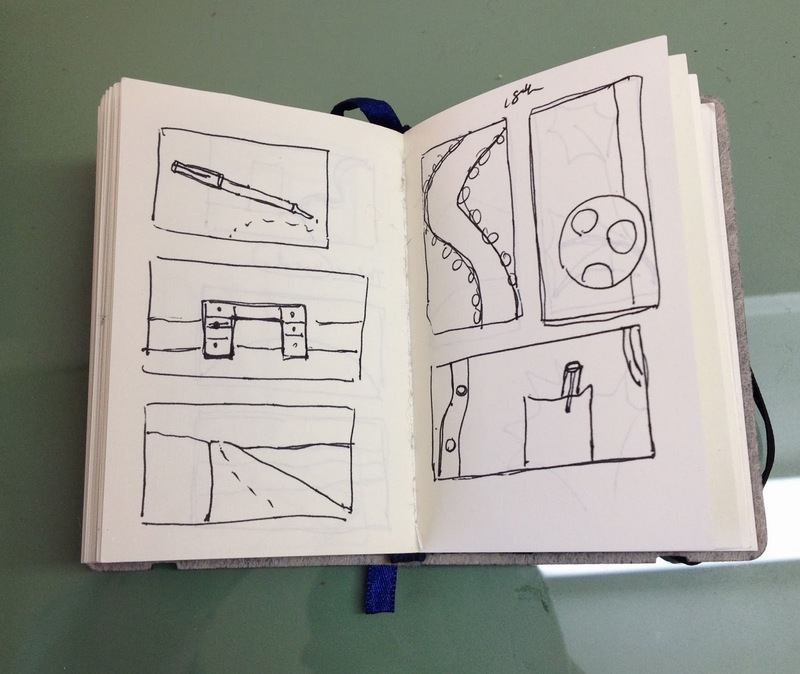 For the diary I have not used any cartoons but I have kept a little sketchbook. Tommye Scanlin supplied all of us in the Weaving the Days of our Lives class she taught at Arrowmont the summer of 2012 with the little 3" by 4" book has held all the days of sketches for the diary since then. 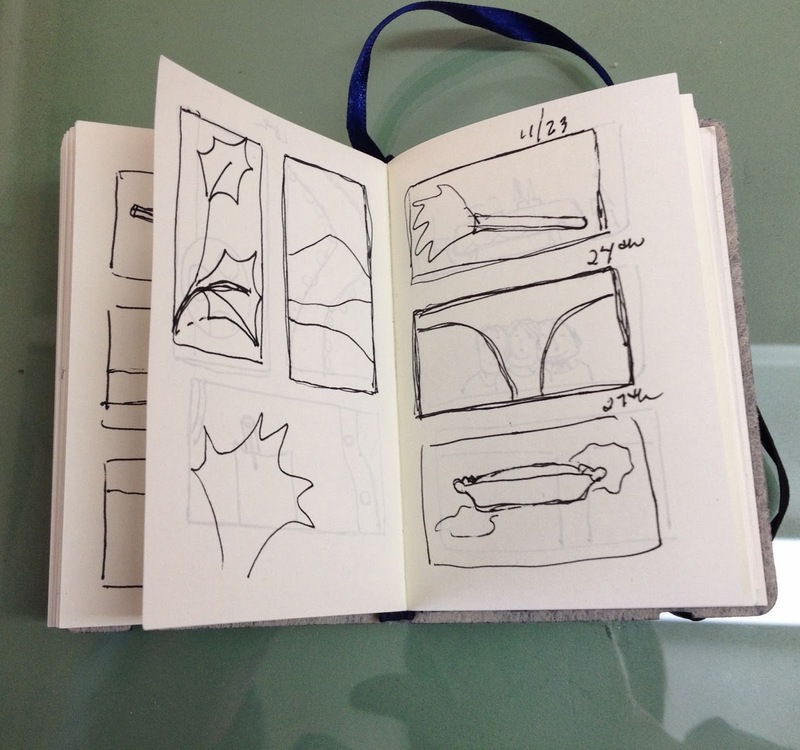 Not having a cartoon makes shaping the design more challenging but one of the purposes of the diary is to expand skills and try new things. I think it has been a positive experience and I have learned a lot by drawing the shapes I want to weave and attempting to weave them without a cartoon to follow. 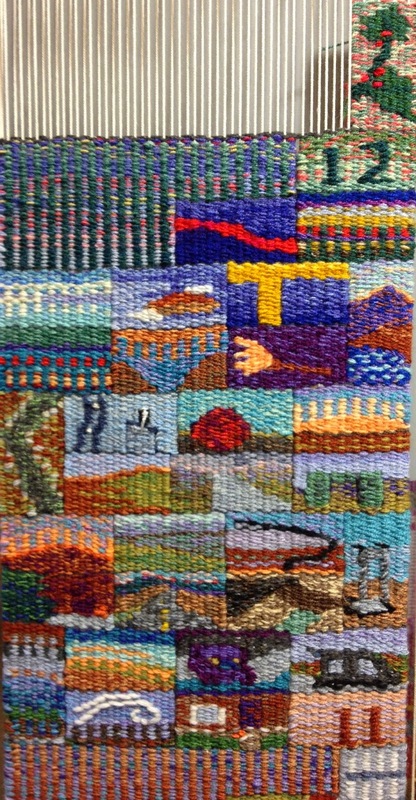 I don't think I will be trying this with any of the other tapestry projects right away. Here are some of the little sketches for November/December. They are very simple because I am just trying to see the shapes. and it is very close to full. I hope to get through the year before the space is gone. 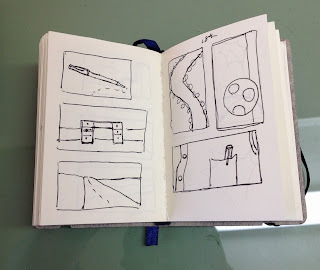 I already have a somewhat different sketchbook that I have used to sketch ideas for 2014 and I will share more about that later. The walls of the studio are up! 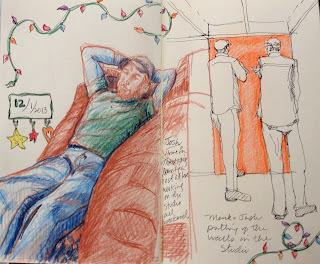 Here is a page from my somewhat larger 5" by 8" everyday sketch book showing Mack and Josh putting up the walls and some down time after. We were fortunate to have beautiful weather for the studio project this past weekend. There is still much to do before I can move in including trim, painting the new walls and finishing the electrical outlets. It is harder and harder to be patient! 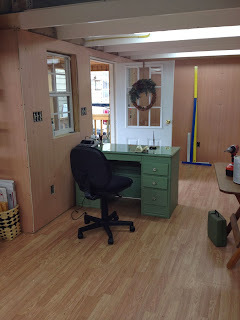 Here is an inside view with the new walls and the refurbished, now green, desk from the attic. The desk belonged to Josh all through high school and had been used hard but now it is repurposed and will serve again. The green paint reminds me of one of the greens I have been enjoying weaving with in the diary. Everything is a series of connections.